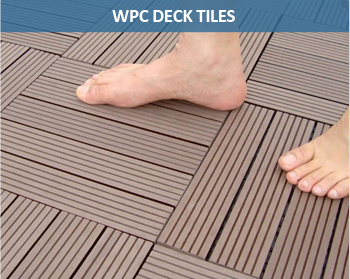 WPC DECK TILE is a unique product for fastest installation, as well as for fastest dissemble. Product is quite easy to maintain and it is typically DIY (do-it-yourself) product for end user. Its fixing system with floor mat can install thousands of square feet in couple of hours. It doesn't need any mechanical fittings for installation, as it's delivered in ready-to-fix format. You can create meters long walkway in a few minutes only. It gives a walking comfort because of good quality plastic floor mats. This is an all weather product. DECK TILE gives typical natural touch to overall ambience where it is used. Technically, it reduces sunshine reflection and absorbs UV radiation. Socially, it is a green product that protects environment with its natural characteristics of anti-water, anti-fungus & anti-termite.